We who live far from our grown kids take solace in the "up" side of distance. When we visit them it is usually for a few days or even longer and those visits can be festive, busy and intense. For a few fleeting days we are part of their everyday lives: We see up close and personally how they live. We pick up on quotidian minutia that they don't discuss with us on Face Time or in texts. It's more intimate and revealing than having children live nearby and dropping by for an hour here and a dinner there. But there's a trade-off. They're here today and gone in another day or two. A friend whose daughter flew in for a two-day visit, texted me in mid-visit: "My apartment is full of life! Today I know what I am missing." Say no more. I know exactly what she means. We are disciplined about being independent. These visits--whether we go to them or they come to us--are a reminder of the price of that discipline. We're not "sweeping up the heart/and putting love away" but the reality is our grown kids live far from us and lead lives very much apart from ours. We can't meet them spontaneously for a Saturday morning coffee. Paterfamilias and I have stopped going to Chinese restaurants on Sunday evenings--they are too filled with three generations of family laughing and talking and sharing fried rice and moo shi pork. And we're not. While the long visits we get are wonderful and "full of life," they are a reminder of how much we miss our children and their families, of how we discipline ourselves not to think about the loss and the excitement the younger generation, whose lives are on fire, bring into our lives. The feelings we have on becoming a grandparent aren't exactly oversold. Let's just say they're more complicated than the treacly bliss a Hallmark card might portray. There's always been this joke about the up side of a day of grand parenting: The good news is that at the end of the day, your grandchild goes home. There are other, more complicated feelings about being a grandparent. Yes, there is the unalloyed thrill of falling in love with a precious new life. But there is also the feeling of being an outsider. A friend--a single mother whose daughter had a baby a few weeks ago--finds her relationship with her daughter has turned upside down. Where mother and daughter had shared shopping and movies and friendships, the daughter's focus is now exclusively (and rightly so) on her newborn; the future of the family is the baby. There's hardly a murmur about the well-being of my friend, who has been asked to babysit three days a week now that the new mom is going back to work. It's a variation on another emotion: the feeling of being a guest in your child's life rather than an insider, a sense that we're looking in no matter how inside we thought we were. As Robin Marantz Henig wrote in a NYTimes essay, on grandmothering, "Even as you get to watch them, right up close, you're always outside with your nose pressed against the glass--and increasingly aware of how much of their story will take place without you." Henig takes that last thought one agonizing step further. I have internalized the stinging knowledge that, beneath all the encouragement you give your children to grow and walk and speak and leave, beneath all the wonderful moments you may be lucky enough to share in and enjoy, your grandchild’s life will be a long string of birthdays you will not live to see. Your thoughts turn powerfully toward the future — one that now includes the grandchildren you adore — at the very same moment you’re reminded of your own absence from that future. It’s an odd mixture of birth and death, which is what gives grandmotherhood its beauty, as well as its specific and poignant pain. I understand what she's saying but personally,I have moments when I'm glad I won't be around to see how my precious grands cope with some of the awful changes the planet and the political world have in store. Or maybe our grands will be part of a solution. Still, it scares me just a little to think my dotage will be so prolonged I'll be here to see more than I want to see. We shouldn't compare. But a recent Pew Foundation study gives us the ammunition to do it. 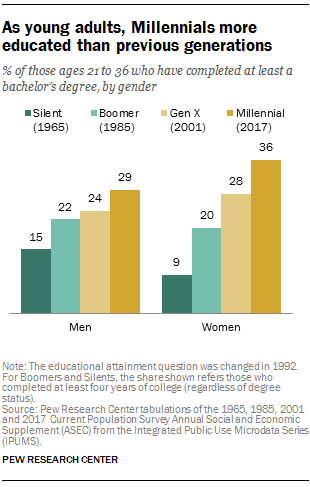 It's our Silent and Early Boomers Generation (born in the 1940s and 50s) vs their Millennials (born in the 90s and 2000s). We're 50 years apart in terms of entering those young-adult years. So how's it going for them versus how it went for us? During the young adult years, they are more likely to be working (71 percent) than we were (58 percent). This shift to more women in the workplace ratcheted up in the mid 1980s, when Boomers were young. They're marrying later than we did. In 1965, the typical American woman first married at age 21 and the typical man wed at 23. By 2017, first-marriage ages hit 27 for women and 29.5 for men. In our day, men were more than 10 times more likely to be veterans than young men today. Millennials can thank the all-volunteer army for that. Men of our generation came of age during the Korean War and its aftermath. More of them are living in cities than we did. In 1965, around two-thirds of young adults lived in a metropolitan area. Today, nine-in-ten live in metro areas. Source: Pew Research Center tabulations of the 2017 Current Population Survey Annual Social and Economic Supplement (ASEC) from the Integrated Public Use Microdata Series (IPUMS).